CHEREAU - Vue du village de Maarsen en Hollande. CHEREAU, J. - Vue du village de Maarsen en Hollande. Vue du village de Maarsen en Hollande. - CHEREAU, J. 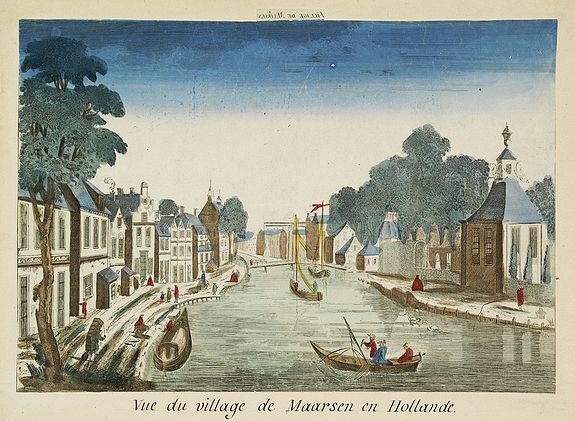 Title : Vue du village de Maarsen en Hollande.. Description :Showing the river Vecht at the town of Maarsen. Published published by Jacques Chereau, who was a well-known publisher of optical prints, established in rue St. Jacques in Paris. Condition : So-called optical print. Contemporarily cut on the neat line and margins extended, with a title in manuscript. The mirror-image engraved title still present in top. In good condition.